In the four hours around the close of polls across Super Tuesday states, searches for “how can I move to Canada” on Google spiked by 350%. By midnight, the query had risen to more than 1000% its normal search volume. It was especially high in Massachusetts, where Trump dominated the field with just under 50 per cent of the vote. 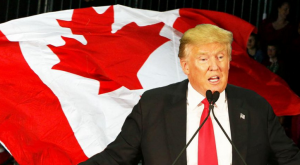 It’s trendy for Americans to talk about moving to Canada if their candidate loses an election. It’s far less common for them to actually do it. According to Statistics Canada, about 9,000 Americans move to Canada per year, compared with about 33,000 Canadians who move to the US annually. And the US has 10 times as many people as we do, so the discrepancy is even bigger when you look at per capita numbers. Politics aside, most people move for more practical reasons, like jobs. … But if this time you really, really mean it, I’ll be considering marriage applications as of September. Must be able to quote John Oliver at length. And eventually Rick Mercer, though I’ll allow you some time to brush up first. Next post: Do you prefer your politicians corrupt or evil?